In May of 2014, Michael was struggling to keep up with his friends on the soccer field. A doctor’s appointment to find the cause quickly turned into an ambulance ride up to Walter Reed National Military Medical Center, where a pediatric oncologist quickly diagnosed him with T-cell Acute Lymphoblastic Leukemia. He was 6 years old. 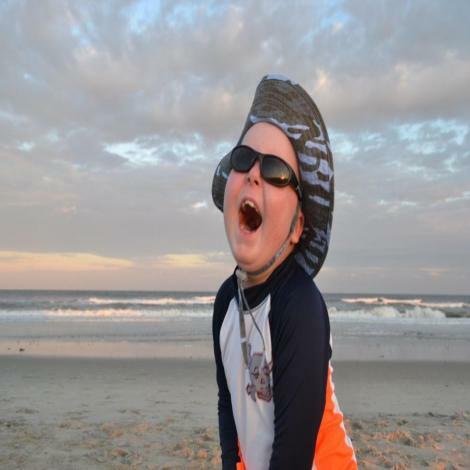 Due to the incredible advancements in blood cancer care, by July, Michael was running on the beach with his sister Carlie and brother Gabriel while his dad threw them footballs. He ended the summer by jogging up the steps of the Philadelphia Museum of Art, Rocky Balboa style, cheering when he reached the top like the fighter he is. Michael enjoys playing chess, cheering for the Denver Broncos, wrestling with his siblings, and watching Jimmy Fallon lip sync on the “Tonight Show.” He continues to thrive and get stronger every day. He has kept his faith and helped so many of us grow ours as we’ve watched his fight. He is truly a miracle. In December 2017, Michael will finally be finished with his leukemia treatment and is looking forward to a very bright future.